Oil analysis typically focuses on the prime mover, or the diesel engine in freight and passenger trains. In addition to the main engine, there are also opportunities to use oil and grease analysis for electric motors, grease bearings, gearboxes, transmissions, compressors and traction motor bearings. In passenger applications oil analysis is also used for the Head End Power or HEP. The HEP is an additional diesel engine used to power lights and provide heating and cooling for the train cars. The locomotive market is dominated by two manufacturers - General Electric (GE) and Electro-Motive Diesel (EMD), now part of Caterpillar. GE dominates the market with about 60% market share, followed by EMD with about 30% market share. GE's popular engines include the FDL and EVO models. EMD's popular models include the 645, 710 and the newer 1010J built to meet modern emissions standards. Combined, there are hundreds of thousands of these engines in use today worldwide. Reliability/Efficiency or Utilization Ratio - when is it ready for duty and how long can it stay in duty? Drain intervals - engines can contain hundreds of gallons of oil. You don't want to change it out until you have to. What is unique about railroad oils? 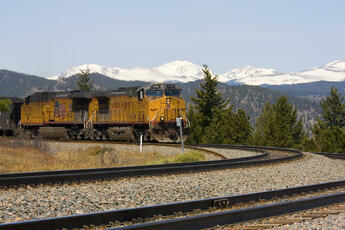 Railroad oils are typically zinc-free, meaning they don't use ZDDP, like traditional motor oils. This is because the wrist pin bushings connecting rod bearings were often made of silver. They would corrode in the presence of zinc. While newer engines no longer use silver, there are still thousands of older engines out there that do. Railroad oils have traditionally been monograde - usually a 40 weight. This is changing with an increased focus on fuel efficiency. 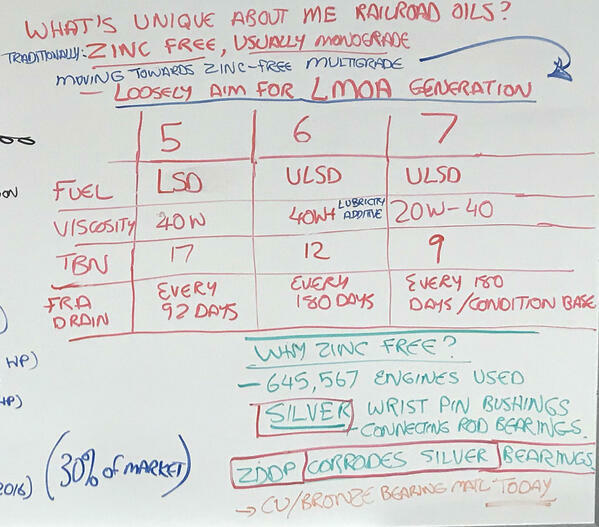 The chart above shows how locomotive oils loosely fall into three groups based on classifications from the Locomotive Maintenance Officers Association (LMOA). These groups are roughly for generation 5 to generation 7 engines. The fuel required starts out with Low Sulfur Diesel having a maximum sulfur content of 500 ppm and trending downward to ULSD with a maximum sulfur content of 15 ppm. This reduction in the sulfur content affects the starting TBN of the oils which has also trended downward. The newer generation oils also have lower viscosity to improve fuel efficiency. The U.S. Department of Transportation's Federal Railroad Administration used to require changing of the oil in the main engine every 92 days. 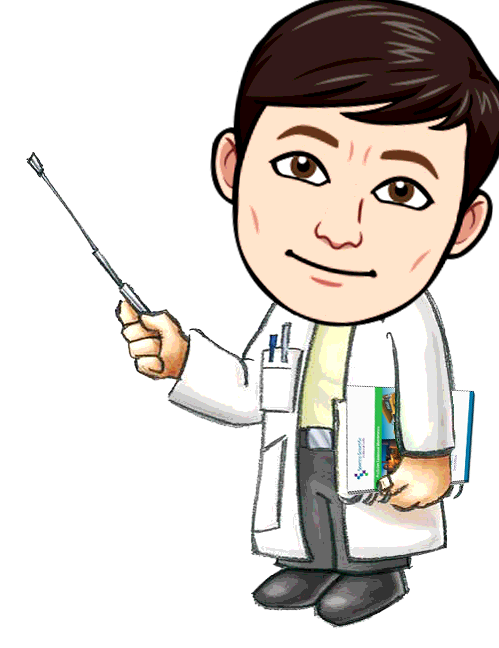 That interval has since been extended to 180 days and can be longer based on oil condition. With hundreds of gallons of expensive lubrication oil, it makes sense to use this oil as long as it is safe to do so. On-site oil analysis allows testing of this oil in minutes, giving you the confidence you need to safely extend the drain interval. 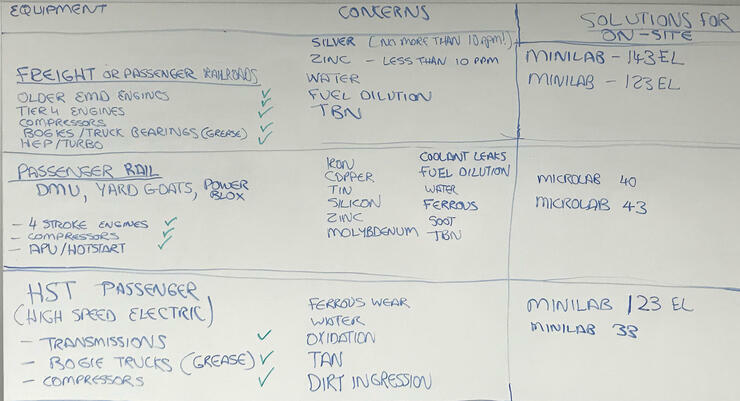 The table below outlines the equipment that requires regular monitoring, the tests to run on each piece of equipment, and the equipment that is best-suited to run those tests. This is meant as a guideline. You should discuss your particular case with one of our oil analysis experts to determine the best solution for you. 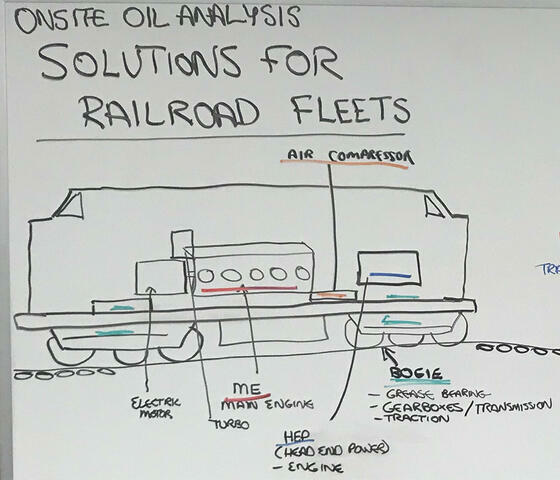 Oil analysis is used regularly by many of the world's largest locomotive fleets to increase Utilization Ratio, extend oil drain intervals and to proactively prevent expensive failures before they happen. Since locomotives are always moving around, on-site oil analysis is the most efficient way to conduct this testing. It provides timely answer while the locomotive is in the maintenance yard.